As the Mariinsky comes to the rescue of ballet-starved Londoners this week, we kick-off our series of features about ballet companies around the world, outlining their history, traditions and differences. Most readers will immediately associate the name Mariinsky to one of the premier ballet companies in the world but equally important are its links to the theatre, the city and the era where it originated, the regal and distinctive tsarist St. Petersburg. Russia’s first theatrical events took place following a decree in 1742 by Tsarina Elizabeth, a patron of the arts who loved Italian opera and theatre. Initially, performances in St. Petersburg were given in the wooden stage of the Karl Knipper Theatre and in the Hermitage Theatre (for the aristocrats), but in 1783, a bigger and better theatre, Antonio Rinaldi‘s Imperial Bolshoi (big) Kamenny (stone) Theatre, purpose built for the emerging ballet (see “The Ballet Company” below) and opera companies opened its doors with Il Mondo de la Luna, an opera by Paisiello. The Bolshoi Kamenny theatre was renovated in 1836 by Alberto Cavos, who also conceived a neo-Byzantine building in Theatre Square (1849) first occupied by an Equestrian circus and later by Opera stagings. This other theatre burnt down in 1859 and re-opened one year later as the Mariinsky, a full-fledged opera house with more than 1500 seats and the biggest stage in the world, named after its royal patroness Empress Maria Alexandrovna. Ballet productions alternated between the Mariinsky and the Bolshoi Kammeny (where La Bayadère and The Pharaoh’s Daughter premiered) until 1886 when the Mariinsky underwent new works, finally acquiring its trademark blue façade and becoming the permanent home for both the opera and ballet companies. The re-inauguration festivities were dedicated to Tsar Alexander II, and included the premiere of the first all-Mariinsky ballet, Marius Petipa‘s Les Pilules Magiques. In the years that followed, many other masterpieces would originate here: from the Petipa canon (The Sleeping Beauty in 1890, The Nutcracker in 1892, Raymonda in 1898 and Swan Lake in 1895), to a number of classic works by Rubinstein, Tchaikovsky, Rimsky-Korsakov and Mussorgsky. The Mariinsky Theatre. Source: Books to the Ceiling. Copyright belongs to its respective owners. During the Soviet years, the Mariinsky Theatre changed its name to Kirov Theatre, to honor General Sergei Kirov, the well-known early communist leader and Lenningrad’s party chief, but the theatre went back to its former Imperial name in 1992. You can take a virtual tour around the theatre here (Quicktime required). The ballet company timeline goes back to 1738, before the Bolshoi Kammeny and the Mariinsky theatres existed. It was the year Tsarina Anna Ioannovna inaugurated the Choreographic School of St. Petersburg, training dancers at the Winter Palace to form the first Russian ballet company. These dancers, initially children of the Palace’s servants, were the first generation of the Imperial Russian Ballet, the school which eventually became the Imperial Ballet School, and later the Vaganova Academy. The school and the company attracted some of the most influential teachers (Franz Hilverding, Gasparo Angiolini, Giovanni Canziani, Charles Didelot) and famous stars from abroad ( Pierina Legnani – whiz ballerina who first performed 32 fouettées, Carlotta Brianza – the original princess Aurora – and Enrico Cecchetti), performing between 1783-1885 in the Bolshoi Kammeny and from 1860 onwards in the Mariinsky Theatre. During the 1830’s Maria Taglioni performed with the company and impressed audiences with her virtuosity and artistry, her presence having left a profound impact. Later in 1859, Arthur Saint-Leon was hired as the Imperial Ballet’s maître de ballet. Saint-Leon created various pieces, of which unfortunately only Coppélia and Pas de Six (reconstructed for the Paris Opera Ballet) remain more or less complete, and inscribed the first ballet notation method, documenting the movements of the upper body. He was succeeded by the legendary Marius Petipa who created more than 60 ballets and introduced novel academic views. At the time of the Russian revolution, under the modernist/neoclassical influence of Fokine (resident choreographer since 1910), the Mariinsky repertoire had evolved beyond the 19th century Petipa classics. Many of its stars joined Sergei Diaghilev in his European tours, collaborating with new influential artists and musicians. The 1917 revolution not only stalled this burst of creativity (Fokine and Diaghilev having left for the West), it also brought difficult times for the company, perceived by the government as unwanted symbols of the tsarist regime and depleted of many dancers (who had emigrated). Thanks to Anatoly Lunacharsky, then minister of culture, the 1920’s saw a gradual acceptance of ballet as an art for the people. Ballet school and company, now re-established as the Leningrad State Choreographic School and the Soviet Ballet respectively, were to observe the principle that dance was a collective expression of the spirit and new ballets based on Russian literature or the struggles of the working class were created. At that time, former dancer turned teacher Agrippina Vaganova “fought tooth and nail” to preserve Marius Petipa’s and the Imperial Ballet’s legacy. During her directorship Vaganova managed to preserve some of the traditions inherited from the former Imperial Ballet while also developing new ideas into a new form of training, the renamed “Vaganova method”, which now has become synonym with the style of the Company. 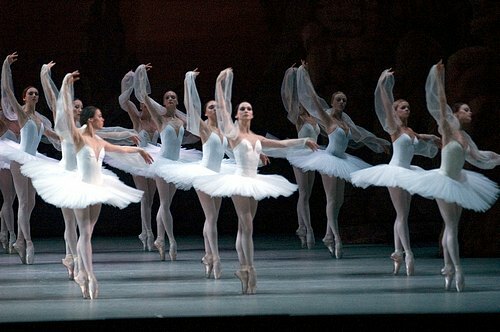 The Mariinsky Ballet performs Swan Lake. Photo: Natasha Razina ©. Source: The Independent. The Soviet Ballet became the Kirov Ballet in 1934. During the Soviet years, many notable dancers emerged, including Lydia Lopokova, Galina Ulanova, Ninel Kurgapkina, Yuri Soloviev, Galina Mezentseva, Rudolf Nureyev, Natalia Makarova and Mikhail Baryshnikov. It was also during this time that Petipa’s choreographic texts were replaced with Konstantin Sergeyev‘s new versions: classics such as Swan Lake, The Sleeping Beauty and Le Corsaire underwent cuts, such as those made to mime passages, and in the case of Swan Lake (1950), a happy ending was adopted. During the 70’s, with defections aplenty (Nureyev, Makarova, Baryshnikov) and the Company’s morale at a low, director Oleg Vinogradov (1977) sought to retain and appease his crop of dancers by expanding the repertoire. Bournonville‘s La Sylphide and Napoli were brought in and staged by Elsa Marianne von Rosen, founder of the Scandinavian Ballet. Maurice Béjart and Roland Petit were invited to create new works. The Tudor Foundation allowed Lilac Garden and Leaves Are Fading to be performed, while Jerome Robbins staged In the Night. The current repertoire also includes ballets by George Balanchine (given his direct links to the Mariinsky), Kenneth MacMillan and William Forsythe and the debated yet acclaimed Sergei Vikharev reconstructions of Petipa’s original masterpieces which now coexist with Sergeyev’s Soviet versions. The Mariinsky dancers have always distinguished themselves in their beautiful port de bras and upper body épaulement, both features of the Vaganova training method. The overall feel is of aristocratic elegance (think Petipa’s princesses), with fluid arms and expression (even if acting is not the main priority), perfect coordination between head, shoulders, neck and torso. Attention to the smallest detail such as positions of the fingers in the hands – that meticulous – give us a sense of movement with musicality. The corps are always praised by their unity and purity of style. Their principal dancers prioritize lyricism and nobility over bravura, qualities that set the Mariinsky apart from its peers. Step-by-step guide to dance: Mariinsky (Kirov) Ballet by Sanjoy Roy. The Guardian, September 2008 [link]. Interview with Ekaterina Osmolkina by Margaret Willis. Dancing Times Magazine, August 2009.